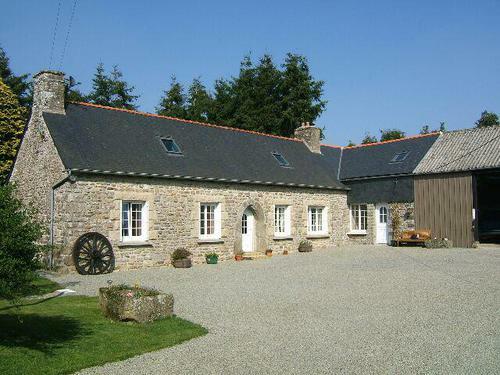 Absolutely stunning renovation of a traditional farm complex in a small hamlet • Huge farmhouse kitchen /dining room with feature granite fireplace (45m2), large living room (38m2), Bedroom (18m2) wc and shower room on ground floor. Two first floor bedrooms (24 and 16m2), one en-suite. First floor annexe consisting of large bedroom (20m2), mezzanine and bathroom • Oil CH (2008).Modern barn attached to house (75m2 floor area) and two stone barns in excellent condition (58 and 40m2 floor). Garage • Lovely secluded grounds of over 1 acre. A delightful property that must be viewed to be appreciated. Spacious accommodation 200m2 approx. Very good condition. Double glazed. ADSL.Broadband available. Taxe fonciere 400pa and Taxe d'habitation 450pa. The vendor says. Since the purchase, we converted loft space on one of the wings and it is now a superb on-suite bedroom that could quite easily be self-contained / granny flat etc. We knocked the kitchen and small living room area into one so now have a nice large farmhouse style kitchen and also opened up the back garden to allow light in as we felt it was getting a bit dark and that has made a nice difference. L'Etang Neuf now has a Museum to the resistance (http://www.tripadvisor.co.uk/Attraction_Review-g3482967-d8702722-Reviews-Musee_de_la_Resistance_en_Argoat-Saint_Connan_Cotes_d_Armor_Brittany.html) and a stocked fishing lake, as well as an excellent restaurant, which is only a very short walk away and is well frequented. 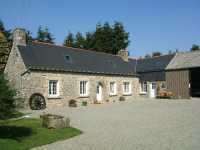 (http://www.tripadvisor.co.uk/Restaurant_Review-g3482967-d3479509-Reviews-Auberge_de_l_Etang_Neuf-Saint_Connan_Cotes_d_Armor_Brittany.html). The village of Plesidy is a couple of km’s away and has an excellent boulangerie (open daily) as well as s small grocery and decent bar. There are many things to do in and around the region, with Guingamp being the closet main town (approx. 7-8km away I think), where there is a weekly market and vibrant town center. Its not too far a distance from the Pink Coast (Rose Granite), which is absolutely stunning on a nice day and is where we often walk during the summer.